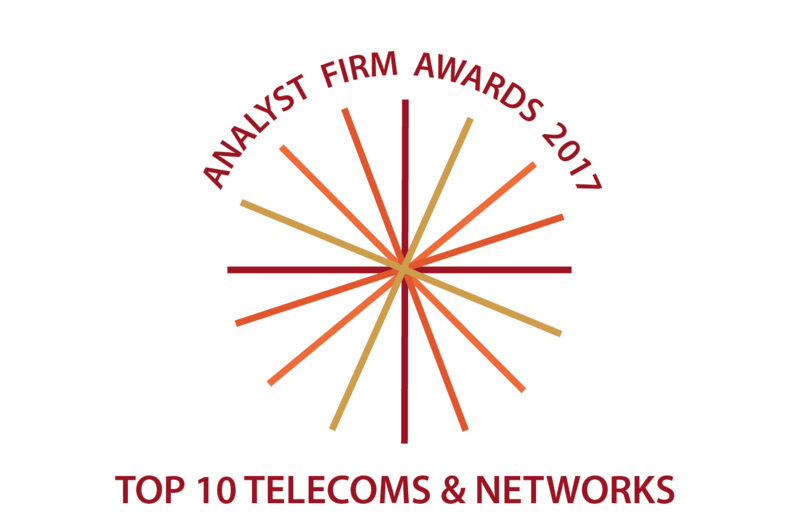 The final category in the 2017 Analyst Firm Awards is for telecommunications and networking. The massive changes in those industries mean that very different analyst firms are emerging, partly because the interests of telecommunications professionals are expanding, and business executives are confirming themselves with telecoms issues more and more. Our telecoms and networking awards reflect the opinions of supply-side and demand-side executives surveyed by the Analyst Value Survey. They are using analysts to better understand mobile technologies, networking, unified communications and a wide range of traditional telecoms issues. These users are also highly concerned with the Internet of Things, and in future awards we will look carefully at the data to see if these two award categories should merge, perhaps also integrating cloud technologies, which are also closely associated. 1. Gartner is the outstanding provider for these issues. It produced 19.5% of all the analyst value consumed by the professionals who took our survey. It was rated highest across all the forms of value we ask participants about: it was rated highest for events and had its smallest leads over IDC in research value and business leads. 2. IDC was very highly rated for research, inquiry calls and reprint rights. The firm is well known for the distinctive perspective that flow from its quantitative insights, especially at the regional level. Its FutureScape perspectives show the firm can also look forward perceptively. 3. Forrester Research actually has higher awareness among the telecoms and networking professionals in our survey than IDC, but its research has to align with its role focus, as exemplified by Daniel Bieler’s telecoms for omnichannel report. 5=. CXP Group’s various brands (PAC, BARC and le CXP) continue to surprise us by challenging Ovum in this award. CXP Group analysts have, for a long time, been among the dozen or so firms most used by telecoms professionals, but its readership remains modest. However, its users continue to say CXP Group’s research, inquiry calls, peer services and events give extremely valuable insight into the IT services and solutions they use: as a result, it now equals Ovum’s value. It also has a higher influence on buyers and investors than Ovum, according to our survey. 5=. Ovum’s fifth place remains its highest place in any of the Analyst Firm Awards, and represents a return to form after last year’s seventh place. It exceeds CXP Group, by a long way, on readership, awareness among clients, and influence on journalists. Importantly, it has more paid subscriptions. 6. HfS Research’s strong peer services are highly valued, but a dip in its events and advisory services pushed it down to sixth place. HfS is, perhaps most known in most industries for its work on automation, even in telecoms, but also its telecoms IT services research is notable. 7. ISG is a great example of the emergence of firms without deep telecoms traditions as the networking space expands into IoT. As in most markets, its value is especially high when it comes to business leads. 8. Global Data, especially because of the business known previously as Current Analysis, comes into the top ten strongly at eighth place. It is very highly rated for its research, which places it in the top half of our top ten for that criterion. 10. KPMG made it into our top ten, helping to push out NelsonHall and Everest Group. Obviously not a pure-play analyst firm, its research-driven content reflects the firm’s CEO focus in the telecoms industry.